Sometimes a piece of writing rustles and stirs the dry leaves that fall too quickly on the pathways of our bustling lives. Like an inexplicable breath of floral-perfumed warm wind, in the harsh bite of a winters day. Rewilding you from inside. …know that you will remember when and where you were when you first read this. You will learn that words conjured together even when read in the cold clinical light of a computer screen, can take you to a campfire in the wilderness where you huddle alone, reading words with only the flickering firelight and lamplight of the moon, with only the winking trail of the Milky Way as company. Rewilding from the inside…. The blood red flower is the beautiful scarlet bloom of Australian native ‘Running Postman’ Kennedia prostrata. Receiving the book was even more startling. It’s an odd thing to open a modern envelope, delivered by planes and wheels and inside find something that almost makes you think you can hear an ancient chant or drumbeat. A beautiful, tactile and totem-like book that feels like it was written and posted from deep in the wild forest. 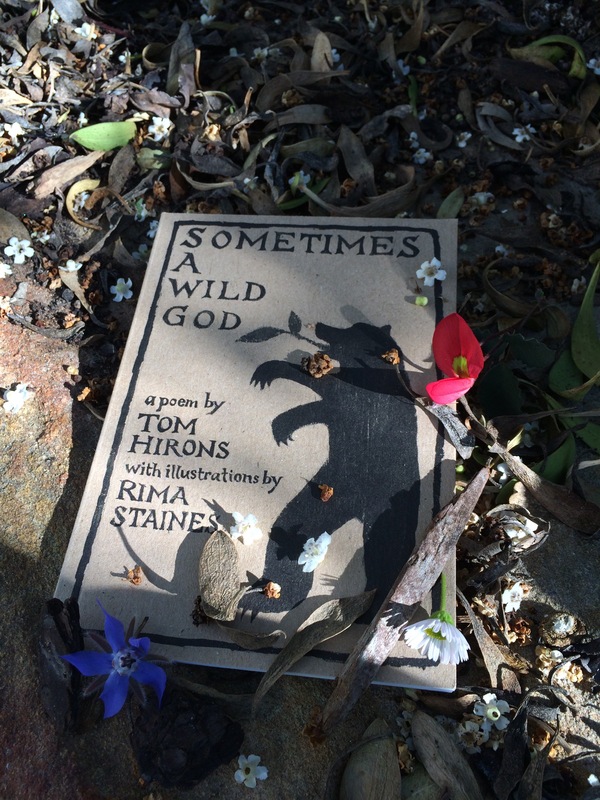 Together on the page with the incredible art of Rima Staines which is itself another soul-trembling delight, in this beautiful small book there is that alchemy of word and art in an ancient dance on paper. The book is small and beautiful. I feels like something to be carried in a favourite coat pocket, a touchstone for breathing in the woods, feeling the old paths, when the yearning strikes. A thing to read to someone, or share because the length and format is perfect for doing just that. I purchased a second copy, to be released into the wild. When the time and place is right to leave it there, a stranger will find it, just there on a bench or table or shelf. The note inside will ask for it not to be kept, and for it to be read, purchased if the reader has the means to, and most importantly, for the wild copy to be passed on to awaken someone else. I honestly feel like I could give a copy to everyone I know, and so I can’t choose just one person, so sharing it with strangers seems like the right way. I hope it finds many new people. Something wonderful in that writing Tom! and Rima’s art is so beautiful! What a beautiful partnership!